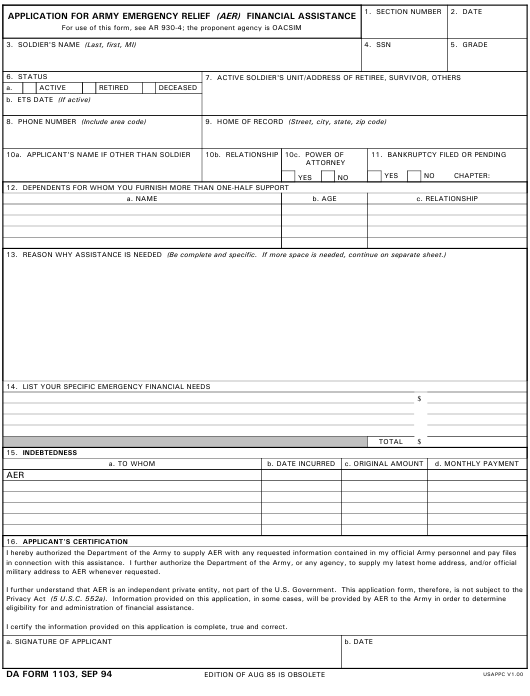 DA Form 1103 - also known as the "Application For Army Emergency Relief" - is a United States Military form issued by the Department of the Army. The form - often mistakenly referred to as the DD form 1103 - was last revised on September 1, 1994. Download an up-to-date PDF version of the DA 1103 down below or look it up on the Army Publishing Directorate website. military address to AER whenever requested. eligibility for and administration of financial assistance. I certify the information provided on this application is complete, true and correct. IS NOT PENDING ELIMINATION FROM THE ARMY. DISAPPROVED. SOLDIER AND COMMANDER HAVE BEEN APPRISED OF REASONS WHY THIS REQUEST WAS DISAPPROVED. assistance being provided to me. I will keep AER advised on any change in my duty assignment, address, or military status.